DigiFlak is proud to announce that a Business Edition of Flak Classic devices is out. Be a pro - Manage Your SSL Certificates and Encrypt Your Files! PureVPN services will be available for Flak Classic users soon. Ever wonder how your solution can integrate with ours? There are 3 options to choose from! Flak Classic is now also running on Windows 10 Home edition. You can either use the same driver, located on Flak drive, or download a newer driver from the Downloads section. We are glad we were about to take part in Cebit 2016 thanks to EIT Digital, who took such a great care of DigiFlak there. Thanks to FutureMatch System we were able to meet plenty of potential technological and business partners, investors and just technically savvy people. Products section on our site has been updated. You can now compare the devices on one page. We went to the new level. Business level. With new coming release we'd give you the power to manage your user certificates on Flak. It took us over a year and we did do it. Check http://digiflak.com/howto/howto_cert/ and http://digiflak.com/howto/howto_logme/ for more info! We have added new How To.. section on our site, so that you'd see that using Flak is actualy quite simple. Ready to come and look at our product and see what we can do with our technolgies? Come and visit us at Cebit from 14th till 18th of March, 2016 in Hannover, Germany on EIT Digital and EEN (European Enterprise Network) joint booth! New EIT Digital newsletter is out! We are proud to be a part of such a great team! We were very proud to be selected one of top 25 companies who took part in SVOD Europe conference in Dublin Ireland on January 27-28, 2016. DigiFlak Wins the EIT Idea Challenge in Cyber Security! DigiFlak has been selected as a one of top nine finalists in the category of Cyber Security and Privacy of the EIT Digital Idea Challenge! Come and hear us pitch in Trento, Italy on November 19th, 2015!! Solving untrusted network which has exploits such as Jetplow, Halluxwater, Ragemaster, etc is actually not that hard. More for Value Added Services for Providers. Small teaser on what's coming soon for the Flak Classic users. Would get even more interesting for Flak Classic business edition users. DigiFlak is proud to announce the signature of distribution agreement for Flak Secuters with Sauris GmbH. Sauris GmbH, founded in 2002 and based in Munich, Germany is a distributor, developer and manufacturer of hardware for application specific devices. Sales team is based in Germany and provides a hot-line support for customers around the world. Sauris markets products and various hardware components worldwide through a direct sales force, and strategic re-sellers. We are looking forward to work with Sauris who provides such exceptional customer service and have a great team of highly qualified specialists! 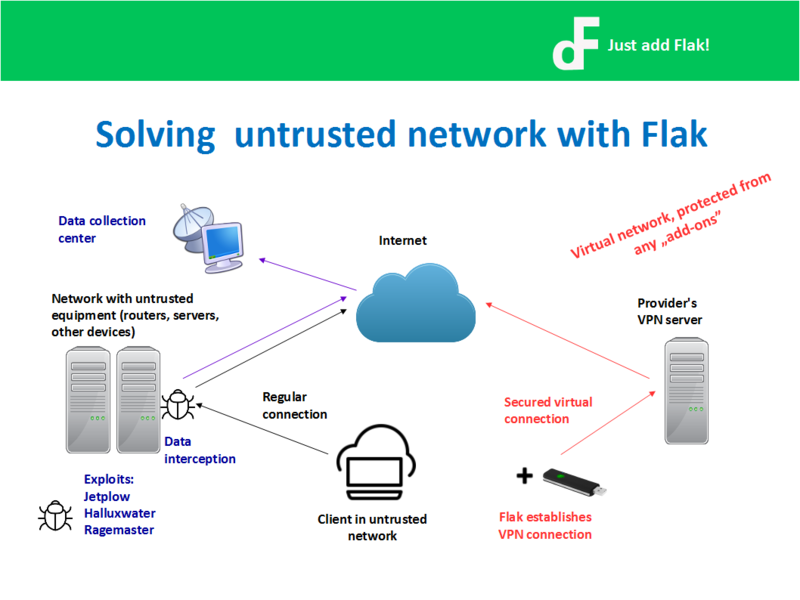 Flak Classic was presented on NXP stand on RSA Conference in San Francisco. Feels great to be in such wonderful company! P.S. we are on 5 o'clock. We are proud to announce that we have joined a Launchpad USA program, available for Amcham Estonia members and is set in a partnership with Amcham Finland. Program is designed to help more companies succeed in the world’s largest consumer market. Launchpad USA is a tailored program that guides the companies from start to finish for doing business in the United States. This program is for Amcham’s growth companies regardless of industry, size or goals. What matters is the desire to expand business beyond the Nordic borders. So much new to learn! DigiFlak joins Startup Blueprint program by Braintree_PayPal. Startup Blueprint provides global mentorship and support for the startup community. Each of our startups receives 1:1 attention, dedication and white glove support from our Startup Advisors, all of whom have started their own startups or worked at an early stage startup. Flak Android SDK ver 0.9 Beta is available for download for FREE. Flak Android SDK is a Flak’s PKI functionality management tool, it can be used in various development use cases when adding different authentication options which use a combination of public and private keys. Which Applications can benefit from using Flak Android SDK? 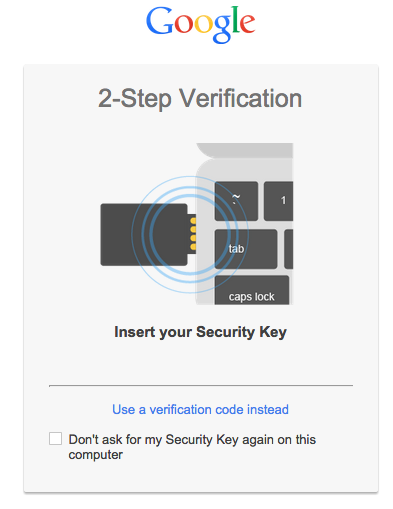 Sign into Google on Mac OS with your Flak! In the end of August Estonian Investment Agency, Samsung Electronics and Science Park Tehnopol hosted a pitching event "Get Global with Samsung“in Tallinn Science Park Tehnopol for connecting tech companies from the Baltic-Nordic region with the global player Samsung. It was a unique opportunity for local companies as such event had never happened before in the region. Samsung came to search for certain technologies in areas such as Sensor Technology, Material processing, Battery & Energy, Security, Healthcare and Artificial Intelligence. Any market-ready technology that could be integrated into Samsung’s future products was taken in consideration. Altogether 14 tech companies from Estonia, Finland and Norway were pre-selected by Samsung and got a chance to introduce their technology. As a result, Samsung asked eight of them to discuss business in 1:1 meetings: DigiFLAK (Estonia), NUTITEQ (Estonia), ELIKO Competence Centre (Estonia, Tehnopol), YOGA AS (Estonia), FlyDog Solutions (Estonia, Tehnopol), Canatu(Finland), Scannanotek (Finland) and 3D Control Systems (Estonia). Samsung representatives were positively surprised with Digiflak product features and were strongly interested in NFC support to provide security for mobile platforms and FLAK DRM for content security on client iDTVs. DigiFlak and Kaspersky Lab, the world’s largest privately held vendor of endpoint protection solutions, have signed a technology partnership contract that will see DigiFlak security computers (secuters) supplied with anti-malware and anti-spam software powered by Kaspersky Lab. More than 80 AmCham member-companies and Estonian Start-Up community including DigiFlak OU had a chance to meet with the Venture Capitalists from NEA (USA) which is one of the largest investment firms with approximately $11 billion in committed capital. A lot of ambitious technology projects were presented on the contest and DigiFlak was among others to enter 10 finalists. In the end the following 3 companies have been announced as the top 3 of the pitching contest: DigiFlak, MRPEasy, and Chief Financial Wizard with DigiFlak OU being the Winner of the Competition. DigiFlak was awarded for LOGMe technology which allows Internet users to access and be authenticated at all WEB sites including social networks, email accounts, Web cloud etc. And all this - fully trusted and without a necessity to remember a single password. One of the biggest events in IT and communications has happened in the beginning of March in Hannover, Germany. DigiFlak OU was one of the headliners presented with Skolkovo community foundation who showed new advanced technologies in internet security to company partners and general visitors. The focus in live demo was directed towards secured cloud solutions for PCs and mobile devices based on FLAKNet and FLAKStream technologies. Also brand-new FLAK Web UI was presented to manage FLAK configuration and user options. Among the main themes of the 2013 Forum there were: development and industrial implementation of emerging technologies, establishment and development of the university based innovative technological infrastructure, innovations in medicine, media, cybersecurity. Prime Minister Dmitriy Medvedev, Prime Minister of Finland Jyrki Katainen and Prime Minister of France Jean-Marc Ayrault opened the event as the Guests of Honor. Top figures of Federal executive authorities, government delegations of Finland and France, executives of leading global companies, outstanding scientists and innovative business experts, foreign guests and representatives of 26 constituent territories of the Russian Federation were among the participants of the Forum. Digiflak took part in the event first time ever and tried to put its best foot forward. As a result the company signed a pool of agreements in the field of emerging technologies and personal and company data protection. Startup Village is one of the largest technological startup conferences in Russia. Over 3000 participants are expected, including startup companies, venture capital funds and mentors, media representatives, government officials, entrepreneurs and institutions. The conference is hosted by Skolkovo Innovation Centre and its partners. FLAK solutions were presented at the biggest telecommunication event in Russia CSTB 2013 together with ADAKTA R&D company. The CSTB exhibition and forum is the premier professional media event of the year in Russia and CIS countries where cutting-edge products and technologies in the broadcasting and telecommunication industries are routinely unveiled.